A common pest throughout most of the world, it is found in grocery stores, food warehouses, grain storage and homes. Both larval and adult stages feed on all food of plant origin, especially grain and grain products like flours, meals, breakfast foods, stock and poultry feeds, coconut, nutmeats, candies, and dried fruit; it is not uncommon to find these beetles infesting pet food, bird seed, and rodent bait. 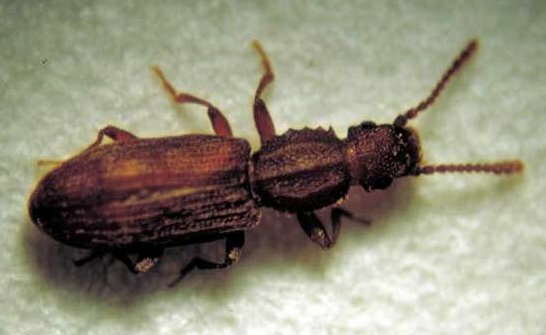 The adult is a small, active, brown beetle, 1/10 to 1/8 inch long, with a flattened body and six saw-toothed projections on each side of the thorax. The abdomen tapers toward the tip. Its body is well adapted for the cracks and crevices where it is often found. Adults do not fly and live about 6 to 10 months, with some living up to three years. The larva is yellowish-white with a brown head and, when fully grown, is usually less than 1/8 inch long.